Gather the women and children and buckle your seatbelts because the great low-lignin alfalfa field experiment is about to begin. It’s been a long time coming. For at least 10 years we’ve all sat in the audience at forage meetings and gazed into the alfalfa transgenic twilight zone while at the same time corn and soybean biotech traits were getting pumped out faster than companies could get their seed catalogs updated. Finally, glyphosate-resistant (Roundup Ready) alfalfa made it to the marketplace, but then a California judge quickly took it away. Alas, would this be the end of transgenic alfalfa, including low lignin? We soon learned that it wouldn't be, as Roundup Ready alfalfa was reintroduced to farmers with the promise that low-lignin would be next. Yes, it’s taken awhile because . . . well . . . it takes awhile for this sort of thing; but the time has come, or nearly so. There are so many interesting angles that it's hard to know where to start, but let’s give it a try. First, understand that HarvXtra is the name given to the low-lignin transgenic trait, not the variety name. In other words, multiple companies will eventually sell varieties with the HarvXtra trait, just as they do Roundup Ready. By the way, the HarvXtra trait and Roundup Ready trait will be linked. You will not be able to purchase a HarvXtra variety without it also being Roundup Ready. This also means there will be two separate technology fees associated with HarvXtra varieties. Exactly how much the HarvXtra technology fee will be has yet to be determined (target date is late 2015, early 2016). Experiments take some time to set-up and it will be no different with HarvXtra. By my count, at least six companies will each have limited supplies of HarvXtra seed in 2016. This first year will be different in a couple respects. Because there is still not enough seed of any one variety, the 2016 offerings will be a blend of several fall dormancy 4 HarvXtra varieties that are in development. In my discussions with seed company product managers at World Dairy Expo last week, the available seed will mostly be strategically placed based on factors such as location, management (control over cutting dates), storage options and past company loyalty. It's likely that most of this first batch of seed will be established east of the Rockies because there are still export restrictions to countries like China. The situation will change in 2017 as one more year of seed production goes into the books. This is when the HarvXtra varieties will begin to differentiate among companies and seed will be more readily available. This is also when we will begin to learn how farmers will decide to manage the technology. Will growers choose to delay one cutting, all cuttings, or no cuttings and simply cash-in on the higher quality? Will it be possible to eliminate a cutting yet still harvest higher yields? All of these options are on the table, and I suspect all will be implemented. For dairy farms that utilize custom harvesters, HarvXtra poses a unique situation. Typically, all of the alfalfa gets cut and harvested at the same time. Will HarvXtra users go “all in” on every acre so that quality is consistent across all fields? Will custom harvesters be willing or able to cut some fields earlier or later than others if there is a mix of HarvXtra and conventional fields? Will it be feasible to just layer all fields together in a bunker or pile? These are all questions that soon will be answered in the great low-lignin field experiment. What will be the acceptance of HarvXtra among commercial hay growers? We know that quality sells for a premium. Intuitively, it would seem commercial growers, especially in humid regions, would jump on the technology. Time will tell. 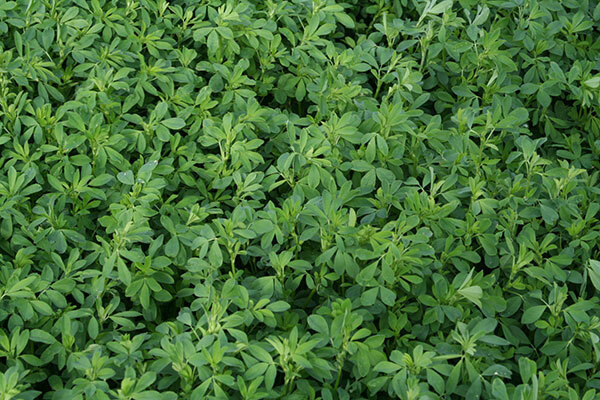 Farmers in the Northeastern states grow most of their alfalfa in mixtures with cool-season grasses. Though they might like the quality enhancement that HarvXtra provides, remember that it also comes packaged with the glyphosate resistance gene. Where alfalfa-grass mixtures are grown, farmers will need to pay for but not use the Roundup Ready trait, seed the grass component after the glyphosate application, or perhaps split the difference and utilize conventionally bred low-lignin alfalfa varieties with slightly lower lignin reductions but no associated technology fees. The fields that get seeded in 2016 and the research trials that have been established in 2015 at several universities nationwide will help guide users of this new technology and answer some of the questions posed here. Conventional or biotech, it looks like we're in for an era of improved forage quality. Watching it unfold will be fascinating. By the way, I’m told protected protein (high tannin) varieties are just a short 10 years away. This trait will have huge feeding and nutrient management ramifications. Learn more at a forage meeting near you.